Gullible – “The correct procedure is not to key in anything on any website that you are unsure of,” he said. An online security expert today said Malaysians were a gullible lot. To prove his assertion, he created a website siapakenahack.com and said it became popular. But what people didn’t know was it was a fake website which didn’t do much. It was created by CF Fong, who is the founder of security services company LGMS. Fong told Star Online today he created the site to educate Malaysians to be vigilant of fake websites. Many Malaysians had accessed the sayakenahack.com website after news reports that a data breach in 2014 had resulted in the theft of personal details of 46.2 million mobile subscribers in Malaysia. The breach resulted in home addresses, MyKad numbers and SIM card information being exposed to the risk of falling into the wrong hands. Fong told Star Online that 500 people had given their phone numbers on his siapakenahack.com fake website just today alone. 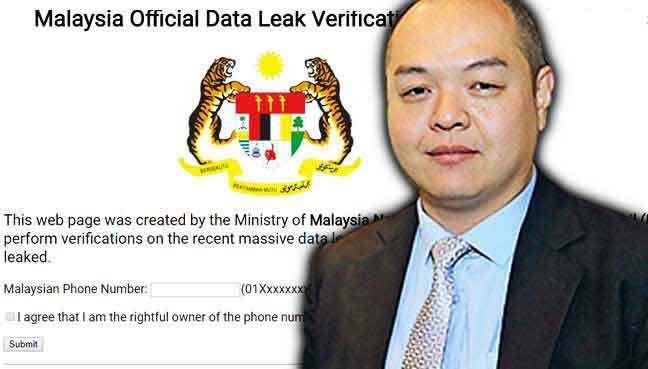 Reports said that 81,309 records from the Malaysian Medical Council, Malaysian Medical Association and Malaysian Dental Association were also leaked. Tech blogger Keith Rozario created this website to enable the public to check if their personal data had been stolen. Rozario said such data was already freely available to hackers or “geeks” to download, as they were the only ones with the necessary skills. However, the site has since been blocked by the Malaysian Communications and Multimedia Commission (MCMC) on Thursday. This followed a formal request from the Data Privacy Protection Department. Rozario said his site will be taken down today.